VR in 2017 was about software growth, and that growth is linked to hardware. The more hardware that sells, the more people invest in VR and development expands. Like any new technology, the consumer demand is extremely high but the price point hasn’t met expectations until recently. The Vive and Rift both represent excellent entry points for VR, and both now boast extensive libraries. Although HTC’s offering features a bit more compatibility with titles on Steam, the Oculus Rift and even mobile will benefit as well from these accessories. Here are the big developments, both at CES and already in the wild, that excite us for the consumer VR space in 2018. Haptics are going to be a focal point for VR development because the system is a bit on the clunky said without some kind of feedback. Good developers can fix this. You can look at The Lab as an example, where moving about can feel very robotic until you enter a mini game where everything feels very organic. This is deliberate, to allow for exploration of the space, but adding haptics will help the experience feel more natural. We profiled the totally awesome looking Teslasuit recently, and gave you an overview of how haptics can help you move and feel real objects in virtual reality. These are both proofs of concept and applications in the wild. At CES, haptics are going to have a big presence. Tactical Haptics has gone so far as developing some applications specifically built for its controllers. 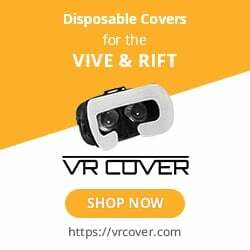 The company will offer compatibility with the Vive and Rift systems as well. Sliding plates built into the control create friction, which can be used to create the sensation of holding an object. Done properly, it would be possible to feel the texture of a virtual object. VRFree is perhaps more ambitious, making gloves they say will be compatible with mobile VR as well. No cameras or cables, all of the technology is about the position of your hands in relation to your space. How this actually plays out in your space remains to be seen. How will these gloves understand where you’ve moved and how quickly? However, paired with the right motion tracking, we could see how gloves would be a lightweight alternative to the traditional controls used in VR today. Motion tracking and room tracking might get a boost this year thanks to some new technology on the horizon. Orbbec is already deployed in the commercial sector to help learn more about spaces, people and objects. It’s an important element in design because it’s a high-precision camera. Package something like this with a Vive or Rift and it might help the existing sensors or make them entirely obsolete. Orbbec is particularly interesting because it can handle up to 16 joints. Range of motion is extremely important in a full body workout, so a system paired with better motion tracking could vastly improve workout and help critique form as well. You can already order HTC’s motion tracking accessory, which offers a greater degree of precision in movement. Precision is important because it helps to orient us in VR. It’s definitely worth an upgrade, even on mobile where a system like NOLO can offer a more tactile experience. CES will also feature some companies working on a more granular level, translating facial expressions and gestures into VR. There are obvious implications for animation, but emotional feedback (even in VR) can motivate and drive our workout. Wireless VR is going to be an abstract concept in 2018, because it could mean one of many applications. It might mean making your Rift or Vive wireless with an accessory like TPCast or Display Link. It could mean some of the haptic devices built for mobile. Samsung’s Gear is technically already wireless in that sense. It may also mean dedicated spaces for VR that aren’t in your home. Wireless VR works well in contained spaces, such as gyms or arcades. The big challenge that we see is how this wireless technology works in practice. The untold story of TPCast is the battery pack you need to carry with you to make the system work well. Latency is also untested territory. Reports on YouTube suggest latency isn’t much of an issue with newly updated hardware, but that remains to be seen in your home. That untested factor will hopefully be a stigma the industry overcomes as the public-face of VR moves toward the setpiece or the arcade. Overall, consumers should be excited to finally get some great controls to use on the glut of titles we have to choose from. VR is getting more precise, and while early adopters are paying a bit more for this new technology, we’re early adopters and we knew what we were signing up for. Overall, the updates showcased at CES will make mobile VR a much more interesting entry point for casuals. Those who pursue VR fitness, whether for fun or to build strength, will also find a lot to love at CES and beyond in 2018. Don’t forget that Blackbox VR is essentially building a workout machine built on the premise of pairing resistance workout accessories with VR. What accessories are you most excited for?